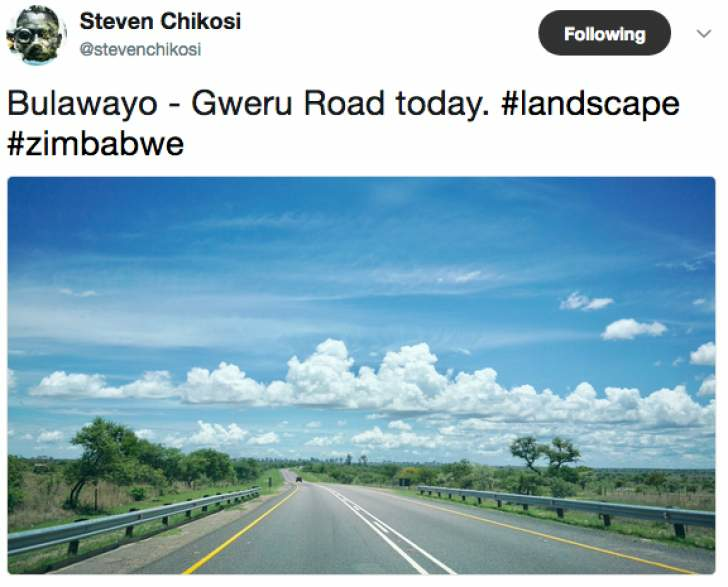 A Harare-based documentary photographer and videographer, Steven Chikosi, has captured a breathtaking image of Bulawayo - Gweru Road. Chikosi shared the amazing picture on Twitter today (Monday). He captioned the beautiful image "Bulawayo - Gweru Road today. #landscape #zimbabwe." One Twitter user @ndakaripa said "You capture the scenery so well 👌🏾👌🏾👌🏾including cluds!" According to stevenchikosi.com, Chikosi has been recently named one of the "top African photographers to follow on Instagram." Another user said the road is so beautiful like people from "Bulawayo - Gweru." Reads @Kuda_Chizura's tweets: "Road kunaka kunge vanhu veikoko Bulawayo- Gweru"
Chikosi's work has also been featured on CNN African voices.